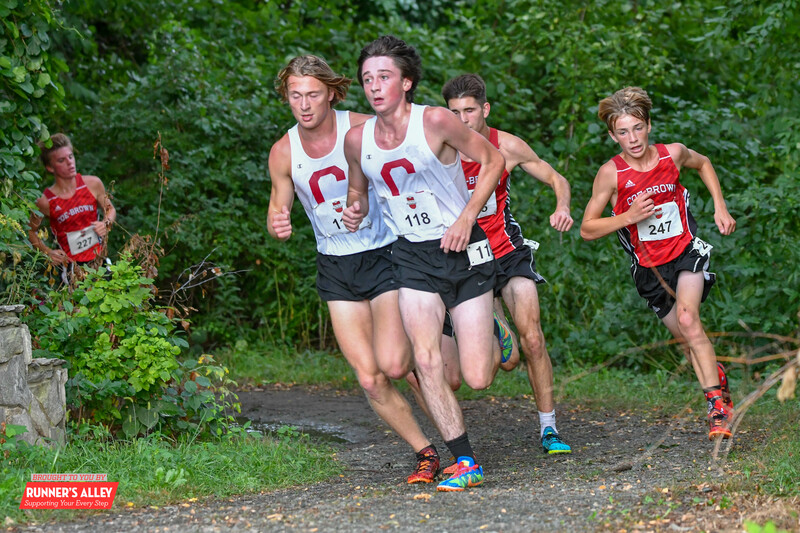 Home » Cofrin Classic » Cofrin Classic Recap, Race Videos, Interviews, Photos! Cofrin Classic Recap, Race Videos, Interviews, Photos! Race Videos and Interviews at bottom of the article! Visit the Cofrin Classic Meet Hub for everything from the past few years within one click! With temperatures hovering in the 90’s and looming scattered thunderstorms in the forecast, the 2018 Cofrin Classic was delayed one hour for obvious safety reasons. It definitely was a wise decision. The race was held at NHTI Community College in Concord. The course is noted as flat and fast around the fields and edges of Fort Eddy Pond. The girl’s race featured defending team champion Coe-Brown (NH #5) led by last year’s individual winner Addison Cox. 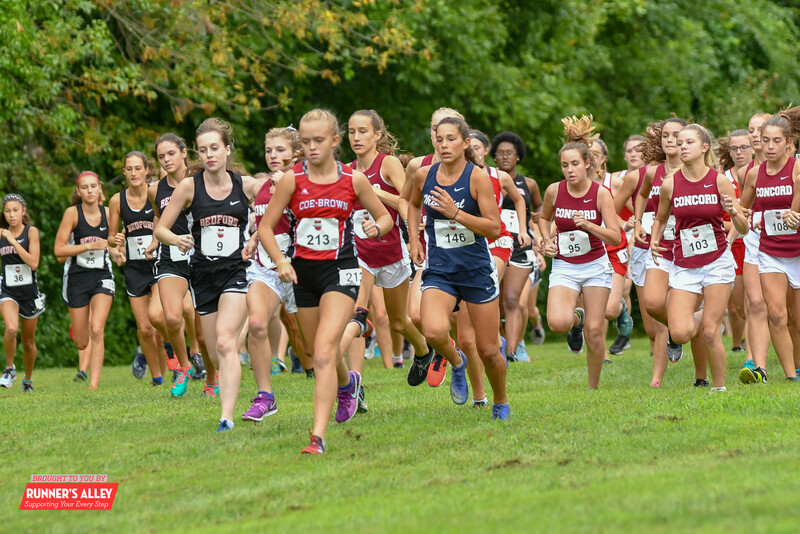 Cox who placed 4th in last year’s loaded Division II Cross Country Championships, wasted no time moving straight to the front easily distancing herself from any significant challenges. The talented sophomore ran smooth throughout and covered the 5K course in an efficient 19:25. 10th graders from different teams would go on to take the next three places. Bedford’s Carly Rinko placed second in 20:14, followed by Concord’s Morgane Orcutt (3rd 20:21) and Morgan Nault of Bedford placing 4th in 20:37. Coe Brown’s Abigail O’Connor placed 5th in 20:46 and Bedford’s Delaney Flanagan was 6th in 20:50. A pair of Concord runners led by freshman Katherine Kennedy (7th 20:57) and Hannah Willette (8th 21:01) finished just ahead of Coe-Brown’s third, Ella Malone (9th 21:04) and 10th place finisher Anna Harnsberger of Bedford in a time of 21:05. Coe Brown’s Tessa Millette (11th 21:25) and Miranda Compton (12th 21:42) closed out the Black Bear scoring. The boys’ individual race came down to last year’s top two Division I finishers. Recent WMUR Hometown Heroes Concord Forest MacKenzie and Eli Boesch Dining ran together for nearly two miles. MacKenzie pulled away in the latter stage of the race finishing in 15:48 breaking the course record of 15:52 set by Oyster River’s Patrick O’Brien. Boesch Dining just missed breaking the 16 minute barrier finishing second in 16:01 for the third fastest time ever on this course. Ultimately, Concord and Coe-Brown alternated for nine places starting from runner-up position. 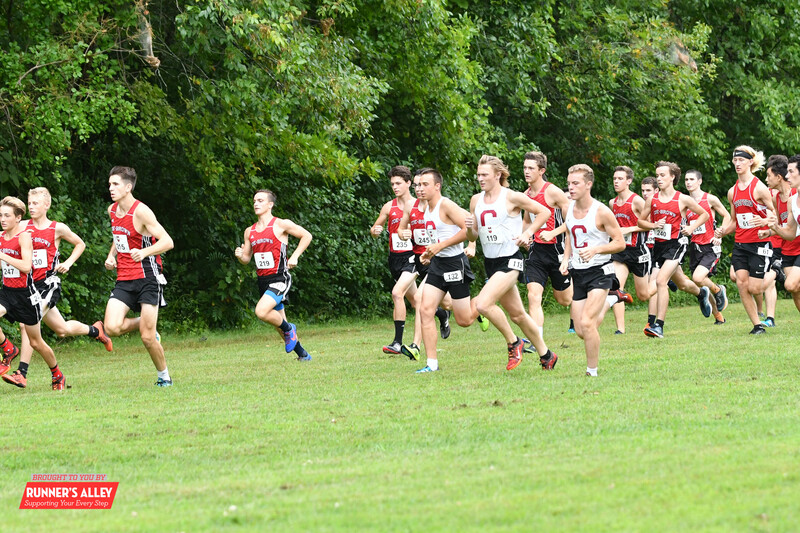 Coe-Brown’s Dawson Dubois placed 3rd in 16:29, Ryan Devine of Concord placed 4th in 16:34, Luke Tkaczyk of Coe-Brown was 5th in 16:35, Aidan O’Hern of Concord was 6th in 16:41, Wyatt Mackey of Coe-Brown placed 7th in 16:42, Brayden Kearns of Concord was 8th in 16:54, Gavyn Lewis of Coe-Brown placed 9th in 17:00 edging out Concord’s Eben Bragg 10th 17:00. Concord’s David Cook finished 11th in 17:19 just ahead of Logan Mihelich of Coe-Brown. The defending State Champion Concord won the team title with 21 points. Keeping it honest, Coe-Brown definitely made a solid argument that they can and will compete with anyone in NH placing second with a respectable 36 points while Manchester Memorial placed 3rd with 93 points. Bedford was 4th with 107 points and Spaulding placed 5th with 141 points. The 2018 season looks very promising for both Concord and Coe-Brown boy’s teams. Concord’s average time of 16:24 compared to last year’s 16:37 despite losing three of their top seven to graduation. Coe-Brown had an even bigger improvement by averaging 16:50 to last year’s 17:23 despite graduating Evan Tanguay, the 2017 Division II State Champion. Results from Week of 9/18 – UPDATED! Previous post WMUR’s Hometown Heroes!!! Next post 9/8/18 Weekend Results – Updated!